I walked out of a 14th century palace today (above), into a street lined with houses constructed in the 1600s or earlier, past a church that’s probably older. I felt like I’d been swept back in time 500 years. The island of Ortigia is a living time capsule. One of many thousand locally-found ancient artifacts in the Archaeology Museum in Siracusa, this one strikes me as a “photograph” of a couple of guys from about 2000 years ago. People have lived here for 14,000 years (per Wikipedia). The walls of the cathedral began life as a Greek temple to the goddess Diana. The large archaeological museum here is filled with artifacts left behind by residents thousands of years before the time of Christ. This house may be the most lavishly decorated in Ortigia. This photo shows the top of the entrance and a window above and part of the decor along the roof line. The oldest palaces line up along the southern edge of the island. Their facades date them to the 1400s when the Spanish were in control here or the Bourbons in the 1500s. Like Lecce, the 1600s found men making great fortunes here and demonstrating their wealth by building palazzi in the baroque fashion. The 1700s continued that trend, but fancier with roccoco style balconies held up by sculputured heads or leaves and flowers. The doorways communicate the time of a buildings origins: in the 1500s they were plain, in the 1600s they became a bit grander, and in the 1700s they were lavishly decorated. St. Peter the Apostle Church in Ortigia is one of the oldest existing churches in Europe. A descriptor in the church quotes a source dating it to 326 AD. Ortigia is an island that is part of the city of Siracusa (Syracuse in English) located on the southeastern coast of Sicily. Siricusa is just over a pair of short bridges. Siracusa holds the modern necessities: homes, offices, and so forth. The archaeological museum is there not far from the large Greek remains: a theatre, some of the coliseum, lots of rocks! People live here! It’s a busy place. I’ve read that fewer than 5000 people actually live on the island. I have also read that 100,000 tourists come to Ortigia each year. I’m here in the off-season but even so on the weekend the piazza by the cathedral was packed with people with cameras, eating gelato and having a great day. The weather has been perfect this week. The people responsible for town government do a great job of maintaining its history while entertaining hordes of people and filling many of the ancient doorways with vendors of pizza and tourist magnets and fashionable clothing and sneakers. This image of the cathedral in Ortigia shows the Greek temple in the illuminated section at the left. My friend Nikki wrote to me yesterday about a visit here that she and her husband made a few year ago. She wrote this: “We walked in the amphitheater of the Greeks!! Don’t forget to try the blood oranges and the lemons unlike any you have ever tasted in America. We visited the grave of Archimedes and the church dedicated to St. Lucy, [the patron saint of Siracusa. ]” As Nikki demonstrated, a visit here is one you’ll not soon forget. Wonderful!! Love your posts! Spent time with a friend today who is originally from Syracuse, NY! Ha! I was at a monastery in Germany near the Rhein River in 2012 that was built in the year 1000. We don’t have history like that in the US! It amazes me how old some buildings and artifacts can be! Thanks Clare, I’m glad you’re enjoying my blog. I’ve been bookmarking all of your trip updates and just today I found the email for your “On the Road Again” December post tucked away in my “DreamToGo” folder. In re-reading it, I am amazed at some of the similarities in our plans. I’m heading out in September for an extended (8+month) trip – Australia, New Zealand, and Mexico with a short pit-stop back in Canada before heading to Europe. My plan is to visit, amongst other, France and Greece before heading up to Ireland, Scotland and England. 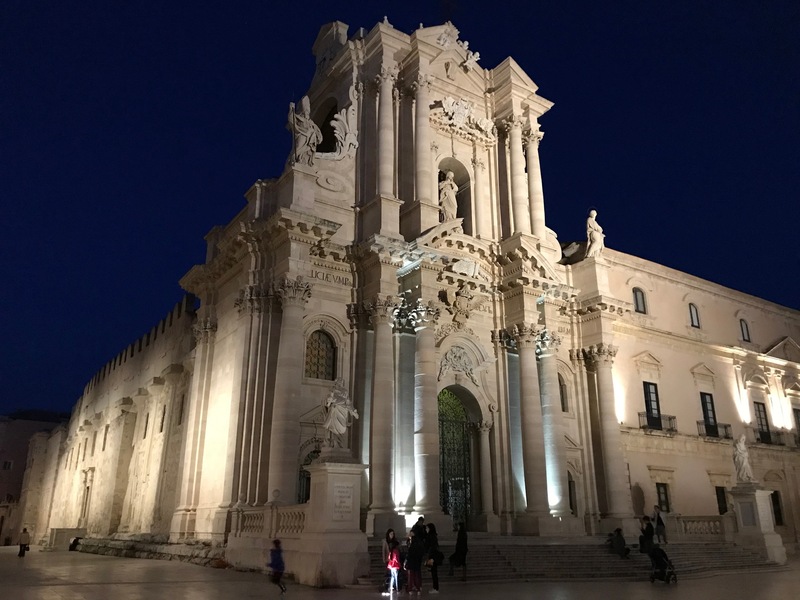 Your photos in/around Sicily have convinced me to add that part of Italy to my itinerary, especially since the timelines are similar although a year apart. I look forward to reading more. PS – you mentioned in that original post that you would be traveling slow and cheaply so I wondered if you were planning any post on the latter subject specifically? Thanks so much for reading my blog and for letting me know you’re doing that. Your trip sounds terrific. I am happy to share any information I have with you. Please just ask if I can be helpful. As for traveling cheaply I think I’ve covered that in some earlier posts. I use AirBnB as much as I can. I use Kiwi.com to find bargain flights. I use AutoEurope for car rentals because they will match any lower price right up to the day you pick up the car. Once I got an airline travel card and got a free round trip flight to Greece with the 30,000 free miles but the interest on that card was exorbitant so I don’t know if I saved much. On this trip I flew from JFK to Paris on Norwegian Air for about $250. It was uncomfortable but I sure saved a lot of money on that! And finally, I buy an annual travel insurance policy from Allianz that provides medical and some trip interruption coverage but no cancellation coverage — it’s very inexpensive. Hi Libbie and t¬hank you so much for taking the time to provide all this information. I seem to be using a lot of the same techniques/approaches as you are so that buoys my confidence. I’m planning to use Airbnb (or similar) for accommodations as well and while there’s been a bit of a push to hostels from well-wishers, I honestly can’t see myself doing it. Late night bathroom runs and all that. 🙂 I also have to keep reminding myself that “budget” doesn’t have to mean “cheap”. Since I sold my condo already and have sold or secured free storage for my few remaining things, this trip actually represents my total accommodations costs for time I’m away. With regard to the insurance, I’m fortunate to have options and will definitely compare costs, including the company you mentioned. Kiwi.com is a source I use too. It was referred to me by another blogger so I’m glad to see it show up elsewhere. I have to admit thou that I splurged on my cross-country train trip (LOVE trains) and my flight from Canada to Australia – it’s my first flight over 7 hours and I couldn’t imagine doing it in a compact airline discount middle-seat type of way. I’m sure I’ll find ways to mitigate those costs and it’s by following great blogs like yours that I’ll learn as I go. Thanks again and now I need to go read your newest post…and some of the older ones that I think I missed. Nice post, filled in some info we hadn’t picked up on on our visit.